I had a great idea a few months ago. It was simply brilliant. It would revolutionize the way we bike. I couldn’t find anything like the idea that I had pictured in my head, and my brain immediately began racing with possibilities of prototyping this idea, patenting it, kickstarting it, and starting a business. I quickly enlisted the help of a friend with a lot of experience with mathematics and mechanical expertise. Obviously, the idea sounds great to him too, and we started searching for away to accomplish what we are envisioning. The crux of the idea is to reduce wasted motion when peddling, allowing the cyclist to apply energy to his forward momentum more consistently and evenly. To accomplish this, I wanted to create a system where the crank arms do not move at a constant (linear) speed around the crank. This requires the left (red) and right (blue) crank arms to be independent from each other, but synced in their motion. 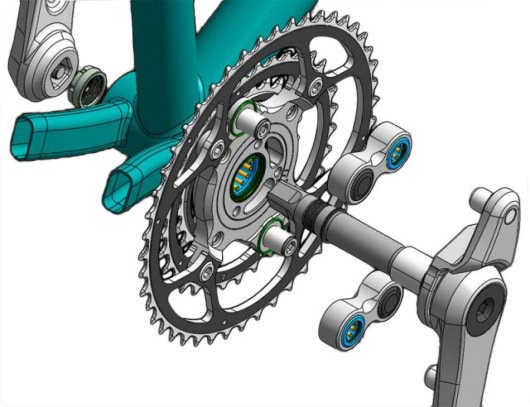 This also requires a some type of gear mechanism that allows the crank gear (green) to move uniformly. Having achieved all this, the result would be a motion where the leg spends more time pushing down in the front of the peddling motion than recovering on the upswing part of the motion. My theory was that eliminating the dead spot completely, and always having one foot in a power position, that cycling would be more efficient in terms of power applied over time. We got to work thinking the problem through in our heads, and what the mechanism would have to be like. We at first looked at non-circular gears, but that turned out to not be feasible. Eventually we looked at planetary gear systems, but that was also very complicated. Every path we took though seemed to have a dead end, or so complicated that it seemed impractical. Then it happened. My friend stumbled upon a company that had already invented this device. It’s called the RS4X (review of RS4X by Gizmag from 2005), and is made by a company called Rotor Bike Components. One of the reasons we didn’t come across this product during our preliminary research is that the company stopped selling them in favor of Q-Rings, or non-cricular crank gears. The company was actually founded around this idea in 1999. What’s surprising though, is that they were not the first. A patent exists for this same design from the 1970’s. A man named Tom Traylor created the design, and applied for a patent. Unfortunately, he was not granted the patent (and unfortunately lost his $2000 filing fee). Similar ideas, it turns out, had been patented no-less than 5 times within the last 100 years, the oldest being an English patent from the 1870’s with a nearly identical implementation to Tom’s, and Rotor’s. Tom made a little write-up about his experience that appeared in Recumbent Cyclist News in 2004, which can be read here. In the 1800’s, mechanical system were all the rage. It’s what people researched, designed, and tinkered with back in the day. It shouldn’t be surprising that this idea had already been explored so many times during the last century. So why didn’t it catch on? I don’t have any definite reasons, however I have some theories. The added complexity of the mechanics lends itself to more frequent malfunctions and failures. The benefit is outweighed by the propensity of mechanical failure. The advantages of such a system are actually negligible in practice. The mechanism is too costly for mainstream usage. Whatever the reason, the truth is that the idea just hasn’t taken off. I’d still like to try one to see what its like though. It was fun to think about. I suppose the real take away is that it’s hard to come up with a completely new, unexplored idea, but if you ever do, jump on it! This entry was posted on Friday, September 5th, 2014 at 2:14 pm	and is filed under Engineering, Missives. You can follow any responses to this entry through the RSS 2.0 feed. You can leave a response, or trackback from your own site.